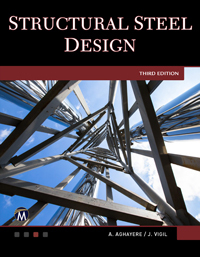 Structural Steel Design, Third Edition is a simple, practical, and concise guide to structural steel design – using the Load and Resistance Factor Design (LRFD) and the Allowable Strength Design (ASD) methods - that equips the reader with the necessary skills for designing real-world structures. Civil, structural and architectural engineering students intending to pursue careers in structural design and consulting engineering, and practicing structural engineers will find the text useful because of the holistic, project-based learning approach that bridges the gap between engineering education and professional practice. The design of each building component is presented in a way such that the reader can see how each element fits into the bigger picture of an entire building design and the construction process. Structural details and practical example problems that realistically mirror what obtains in professional design practice are presented. Abi O. Aghayere (PhD) is a licensed professional engineer and a professor of structural engineering at Drexel University. Jason Vigil, P.E., S.E. is a consultant in Rochester, New York with more than 15 years of experience as a structural engineer, specializing in buildings of varying complexity and is an adjunct professor at the Rochester Institute of Technology.